Southern Azerbaijan is a region in northwest Iran which lies south of Armenia and the Republic of Azerbaijan. The region’s most important city is Tabriz, which is located in the north of the region. Southern Azerbaijan has a great geographical and environmental diversity, made up of mountains, valleys, forests, lakes and marshlands. Southern Azerbaijan is populated by Shi’a Muslim Azerbaijani Turks. They speak a Turkic language that is similar to Turkish and Iraqi Turkmen’s. It is extremely difficult to give an accurate estimate of the population, since it has been reported that the Iranian authorities tamper with the official statistics. Estimated 70% of the population of Iran is not Persian and Turkish descent makes up 40% of Iran’s population (estimated to be around 30 million). There are additionally large communities of Azerbaijani Turks living abroad, not only in Azerbaijan, but in countries such as Turkey, Russia, Georgia, U.S.A, Kazakhstan, Germany, Ukraine and Canada. Many immigrants from the Southern Azerbaijani territory have moved to other parts of Iran, such as Tehran. At present, nearly 8 million Southern Azerbaijanis live outside of Southern Azerbaijan, where more than 6 million live in the city of Tehran. Also one million of them are political immigrants, living mainly in Europe and North America. The civil struggle for the restoration of the national rights of the Southern Azerbaijani Turks, including those living in Tehran, continues in the face of systematic suppression of the Turkish heritage and language by the Iranian government. In recent years, Tehran’s disregard for the well-being of the Southern Azerbaijanis has primarily revealed itself through the case of Lake Urmia. Previously the world’s biggest salt lake, Lake Urmia is rapidly shrinking due to the construction of several dams in the rivers that feed it, redirecting the water to irrigate lands outside of the region. The gradual disappearance of the lake gravely affects the surrounding area, destroying the original ecosystem as well as the lives of the Southern Azerbaijanis populating it. The language, culture and heritage of the Southern Azerbaijani people are being suppressed today in a number of ways. Even though the Iranian constitution enshrines the right to minority groups to use their own language, in practice the central government prohibits use of Azerbaijani Turkish in schools. As a consequence, no education in Azerbaijani Turkish is available at any level, including the University of Tabriz, where seven other languages are taught. Additionally, a number of street and place names have systematically been changed into Farsi. Overall, there is a strong feeling that the Azerbaijani cultural and historical heritage is being ignored, and even in some cases physically destroyed by bombing to make way for new buildings, in the case with the Ark Castle in Tabriz. The Azerbaijani Turks have demanded more cultural and linguistic rights, especially the right to education in the Azerbaijani Turkish language, a right that is enshrined in the Iranian constitution. However, in reality, schooling in Azerbaijani Turkish is prohibited and at the Iranian universities there is not a single linguistic department for Turkish. Alongside this, all state television and radio channels are broadcast in Farsi, further neglecting the constitutionally granted rights for minority languages outside of the private sphere. Southern Azerbaijanis also want to be able to use their language when in contact with regional authorities and the judicial system, a basic cultural right as set out in article 26 of the International Covenant on Civil and Political Rights. Southern Azerbaijani culture and identity are closely linked to the territory they historically inhabit. The northwest of present-day Iran has been the Azerbaijani Turks’ homeland for thousands of years. Under Iranian rule, however, Southern Azerbaijan has been split up into several different regions in an effort to separate the peoples of the region from each other and from their native languages and culture. 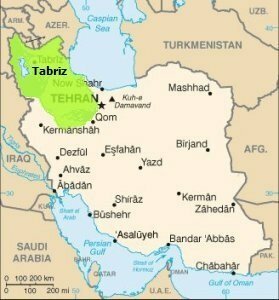 Iran’s regimes have also relocated groups of Fars into some of the Southern Azerbaijani provinces like Qazvin and Hamadan. This assimilation policy – reaching beyond the case of just Southern Azerbaijan to any other non-Fars community - has led to a significant social and national identity crisis. Another issue linked to the discrimination of minorities, is that of women’s rights. Southern Azerbaijani women face double discrimination, since their experience of inequality in terms of gender – and their confrontation with Iran’s repressive policies regarding womens’ rights – is paired with that of belonging to a minority group. The Iranian government has been running widespread propaganda against non-Fars groups in Iran, hoping ethnic peoples would stop embracing their own traditional cultures and assimilate into the Persian centralised model. As part of this trend, Azerbaijani Turks are often portrayed negatively in the Iranian media. This includes offensive stereotyped portrayals of them on television and in cartoons. In November 2015, Azerbaijani Turks raised a protest over a popular children’s TV show depicting the ethnic group as dim-witted and having a bad smell. While such portrayals deeply offend many Azerbaijani Turks, the protests organized in response initiate a feeling of stronger unity and solidarity. The rise in Azerbaijani Turk nationalism has made the central government in Tehran feel increasingly threatened. Iranian authorities accuse the Azerbaijani Turk nationalists of promoting “pan-Turkism” and committing disobedience of God and the imams. Along with other non-Persian nationalities in Iran, Azerbaijani Turks also suffer from economic discrimination. This discrimination against non-Persian peoples has been led by the tight centralism of the state since the 1979 Revolution. As a local newspaper disclosed, government investments in industries and mines in Kerman, a central city in Iran, have been 300 times bigger than in the four Azerbaijani provinces. The economic consequences of such policies and practices severely influence the daily lives of non-Persians in Iran. Strict rules in the financial system and a severe lack of government investment in the region of Southern Azerbaijan have contributed to mass emigration from rural areas. More than eight million emigrants now live in poverty around the capital and other central cities. One of the most precarious issues faced by Azerbaijani Turks today is the gradual destruction of Lake Urmia, previously the world’s biggest salt lake. Due to a ruthless dam construction on the part of Tehran, which intensified in 1988 after the end of the Iran-Iraq war, the lake had lost 90% of its original water volume by 2015. The devastating consequences of the lake drying up are met with indifference by the central government. The 62 dams – either constructed or planned – in the rivers flowing into Lake Urmia mainly serve purposes of irrigation for intensive agriculture. Meanwhile, due to a lack of adequate water treatment facilities and municipal control, the lake is used entirely as the common sink of the urban, agricultural and industrial waste of the region. This in combination with a dramatic increase in the lakes salinity puts the entire eco-system of the lake itself and its surroundings at risk. Many ecologists, activists, and even Iranian officials have warned that if the lake dries up the consequences would reach far beyond Southern Azerbaijan or Iran. If wind and storm get a hold of the estimated 8 billion tons of salt at the bottom of Lake Urmia, serious levels of wind-borne salt toxicity would gravely affect both human health and agricultural production in Armenia, Azerbaijan, Iraq and Turkey. Environmental issues in Iran tend to be inherently political and arguably intertwined with human rights abuses, the predicament of Lake Urmia is naturally highly politicized. The lake has been at the center of wider geopolitical concerns, particularly when taking into account that its salt is highly rich in uranium. Moreover, in light of Tehran’s systematic persecution of minorities, it is widely believed that the authorities have been willfully ineffective and passive in allocating funds for rescue and revival projects for the region, majorly inhabited by Azerbaijani Turks. Another critical issue is formed by the harassment and imprisonment of activists mobilising in defense of Azerbaijani Turk culture. According to the United Nations High Commissioner on Human Rights, several high profile Azeri cultural activists, such as Mahmudali Chehregani, the founder of the Southern Azerbaijan National Awakening Movement (SANAM), Mohammed Hossein Tahmasbpour, an Azerbijani Turkish language poet and Dr. Mehdi Parham, a translator and writer, have been arrested arbitrarily and in some cases jailed on trumped up charges. Mass arrests by the Iranian government have also been a common feature of Azerbaijani Turk cultural gatherings and demonstrations. According to Amnesty International, hundreds of Azerbaijani Turks activists have been jailed, accused of “acting against national security” when in fact they were demanding equal linguistic rights. There are several reports of occasions when the Iranian authorities have arrested people in Azerbaijani gatherings. Azerbaijani Turks have been detained and sent to prison on charges such as “establishing organizations against the system” and “spreading propaganda against the system”. Some of these sentences were up to eight years long, and individuals were held without legal representation. Over the past years, several reports have come out shedding a worrying light on the harsh conditions that political activists – Azerbaijani Turks and others – are subjected to in the Iranian prison system. In 2016, several dissidents, perhaps most notably Azerbaijani Turk activist Morteza Moradpour, have initiated hunger strikes to protest the conditions of their imprisonment and to demand the grounds of their sentencing be reviewed. Tragically, rather than giving in to these demands, Iranian officials have transferred some activists to the infamous Gohardasht Prison, well known to be one of Iran’s harshest prisons.